First came the Hightower. 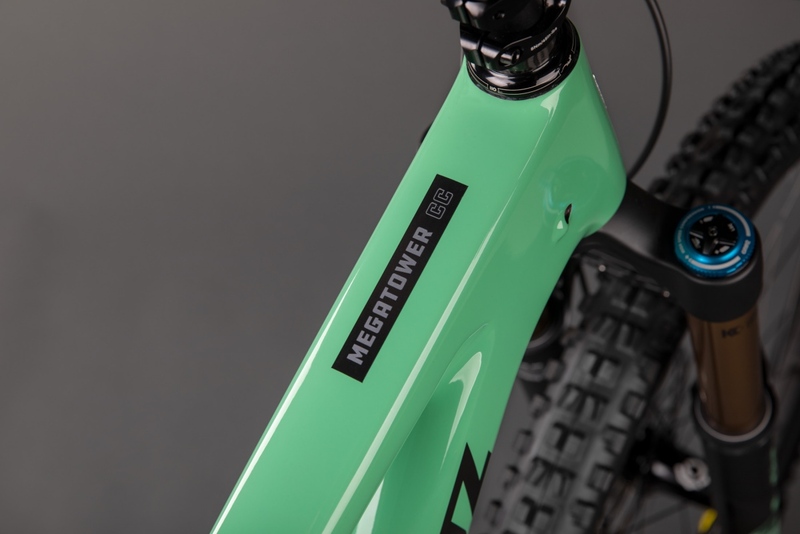 Next was the Hightower LT. Now the progression continues with release of the much rumored and now confirmed Santa Cruz Megatower, a 29-inch wheeled brawler that’s ready for the Enduro World Series or whatever gnar you want to throw at it. 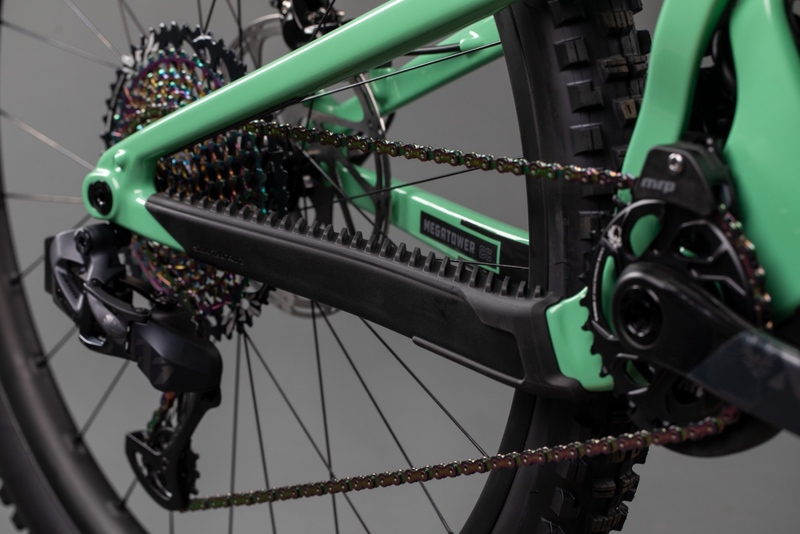 The two frame color options of the new Santa Cruz Megatower [click image to enlarge]. 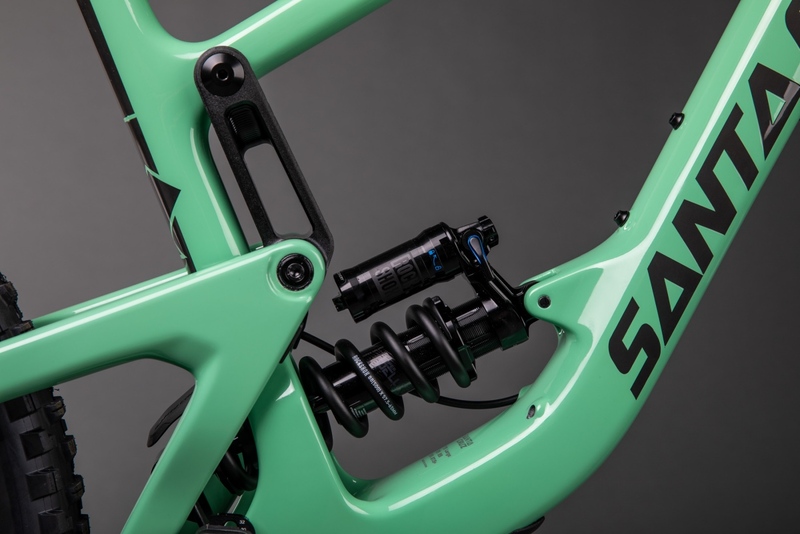 Key metrics include 160mm travel front and rear, 65-degree head tube angle, 76-degree seat tube angle, 470mm reach size large, and a lower link mounted VPP suspension design. 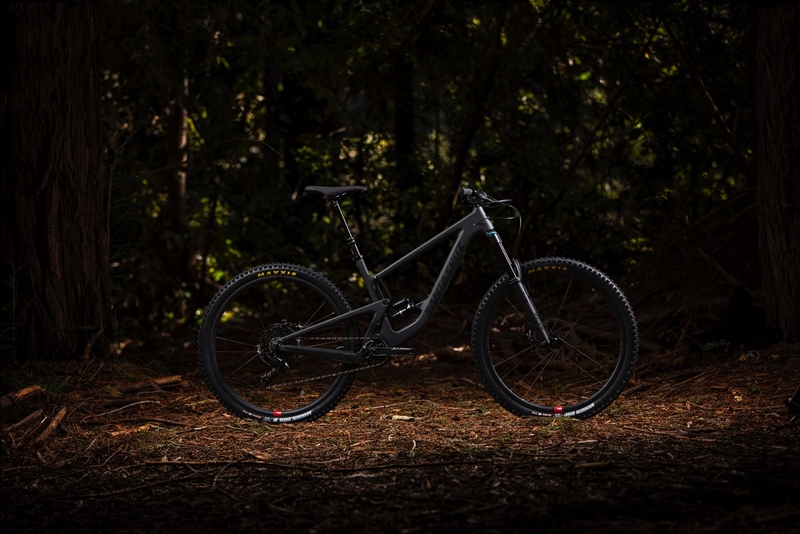 The new beast of a bike is available in five frame sizes (S, M, L, XL, XXL) and Santa Cruz’s standard two carbon frame variants, C and the stronger, lighter and more expensive CC. 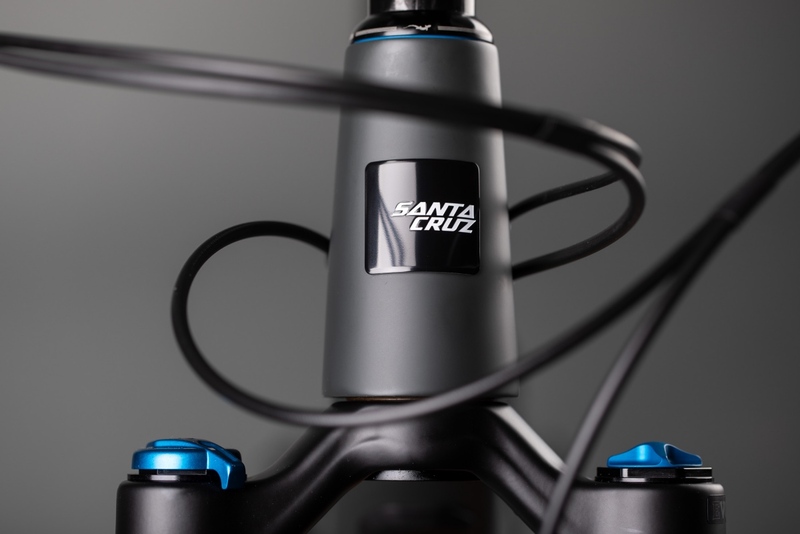 The Santa Cruz Megatower is driven by 160mm of VPP suspension that plays nice with air or coil shocks. 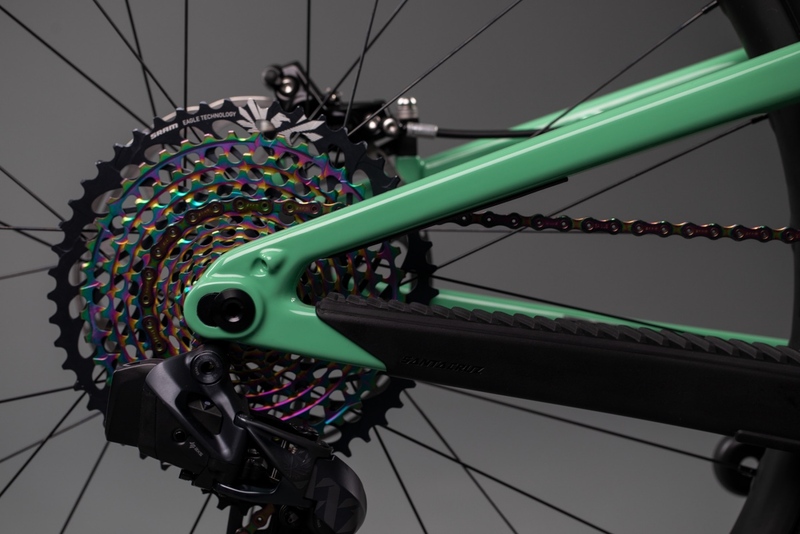 Perhaps most interestingly, the Santa Cruz Megatower frame has two flip chips. 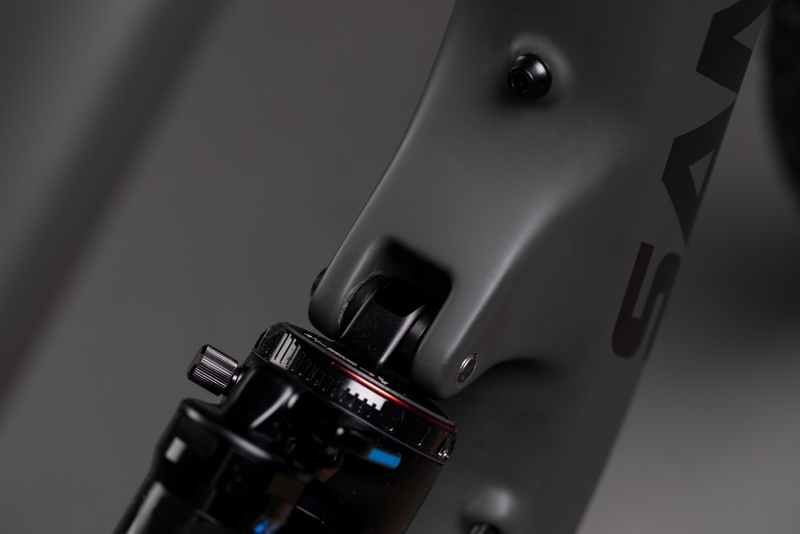 One is located in the dropout and allows for 10mm of chainstay length adjustment, putting the range from 435mm to 445mm. 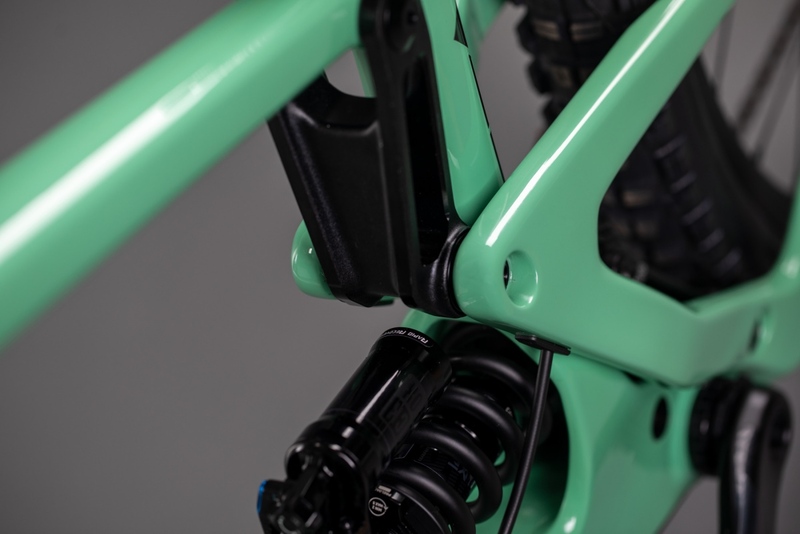 Tire clearance is 29×2.5 in the short chainstay setting and 29×2.6 if you opt for the longer setting, which puts wheelbase on a size large at 1241mm. 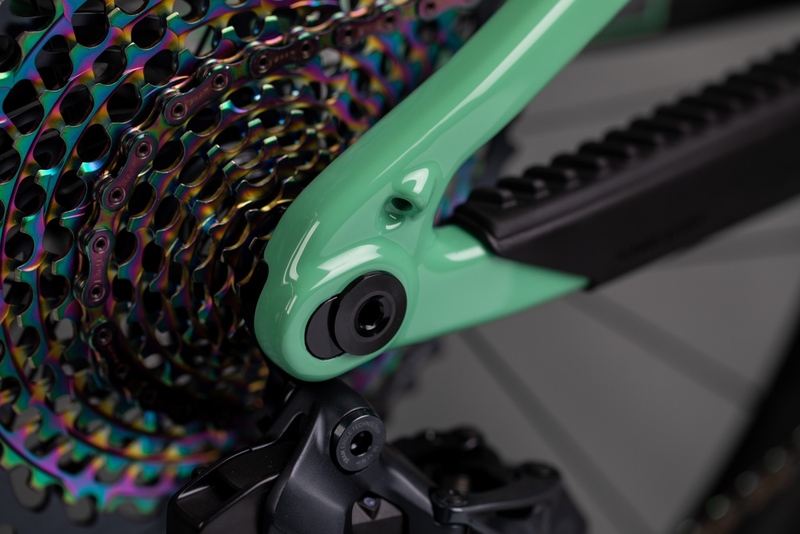 Flip chips on the chainstays and lower link allow for extensive performance customization. 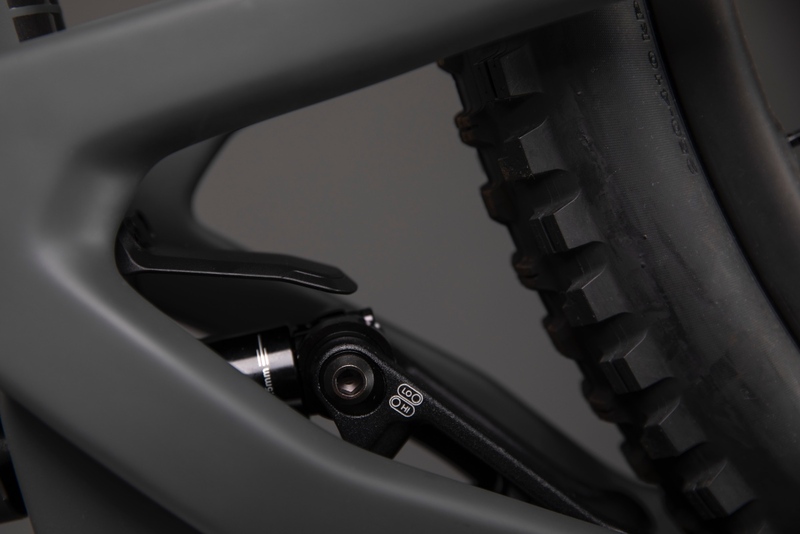 The other flip chip is in the Megatower frame’s lower link, providing geo adjustment (-/+ 3.5mm in BB height), which helps preserve BB height for “over-forkers” and allows riders the ability to fine-tune their ride. 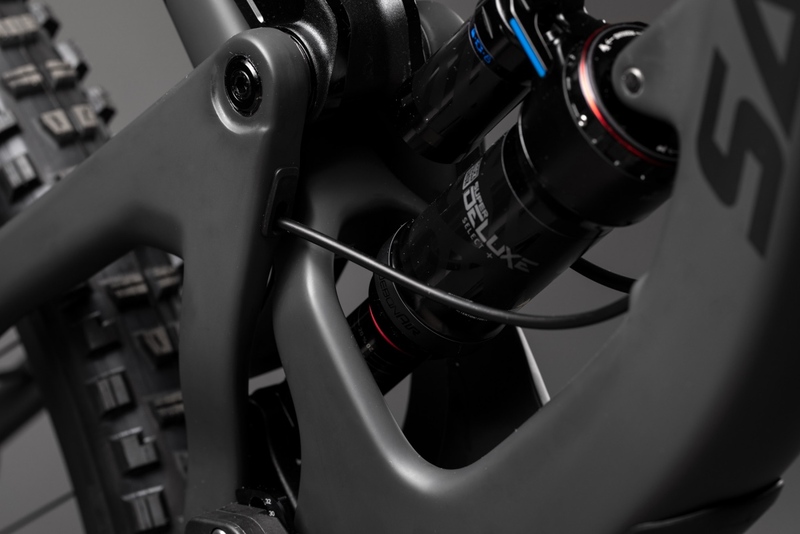 Fork compatibility range is listed as 160mm up to 180mm. 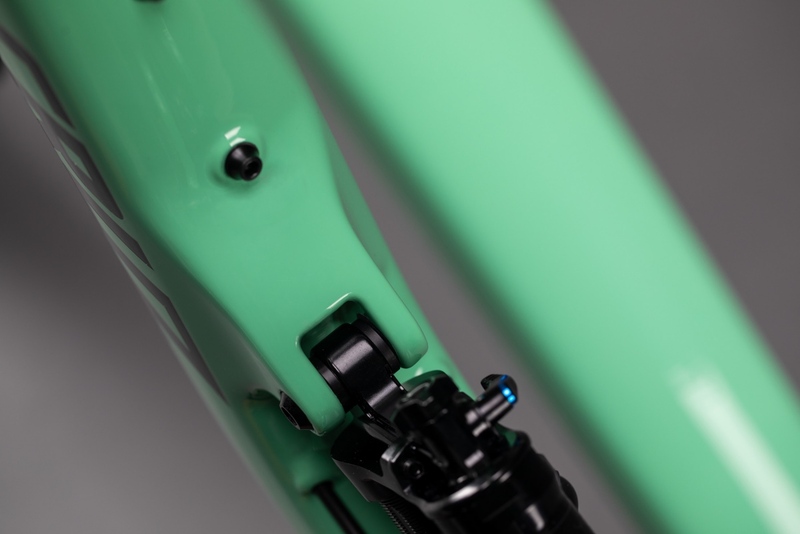 When the lower link flip chip is set in Lo Mode, reach drops to 467mm size large, while headtube angle slackens to 64.7 and seat tube angle moves to 75.8. 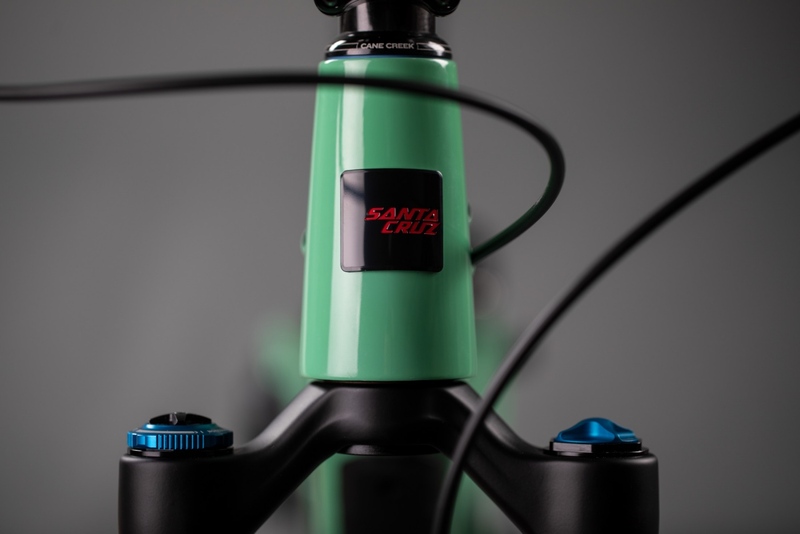 Other notable features of the Santa Cruz Megatower include the ability to fit a water bottle and piggyback shock inside the main triangle, a leverage curve that’s designed to work with coil or air shocks, metric sizing that works with the bearing shock eyelet, 1x only and up to 36t chainring clearance, ISCG-05 mounts, and a shock fender, shuttle guard, downtube protector, and ribbed chainstay protector. The bike also comes with a lifetime warranty on frame, bearings, and Reserve carbon wheels if you’re so inclined. 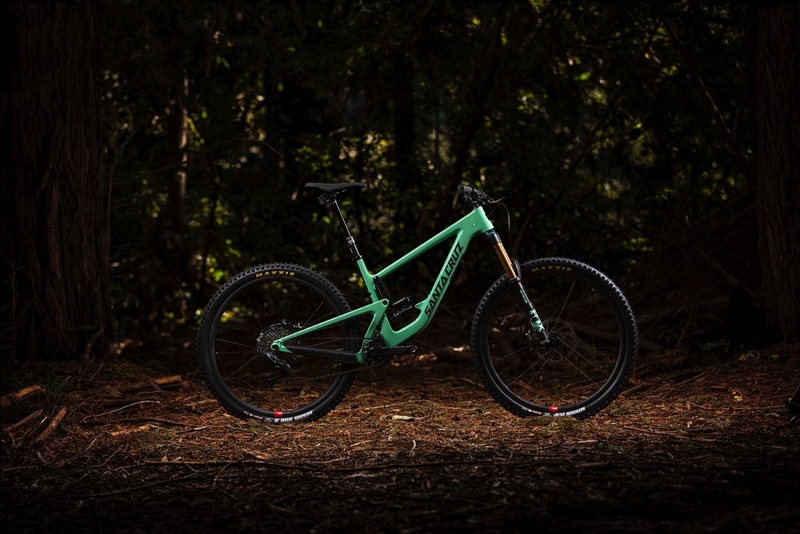 Price/build options in the U.S. market range from $3299 for a CC frame and shock to $10,499 for a dream build spec’d with SRAM AXS wireless electronic drivetrain and Reserve carbon wheels. In between are six more build options that go from $4499 to $9799. 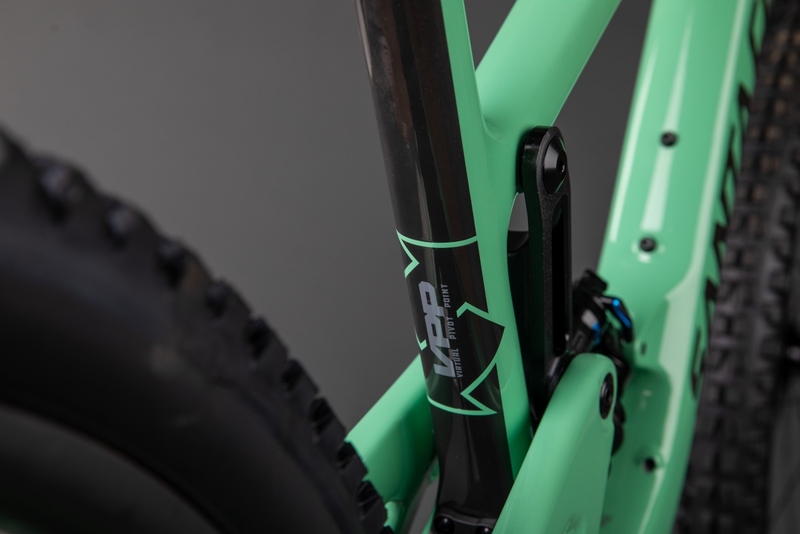 Some of the component highlights include Maxxis Minion DHF (2.5)/DHR II (2.4) on all builds, 170mm travel droppers on all frames size large and up, 200mm rotors front and rear, and either e*thirteen or MRP chainguides stock. 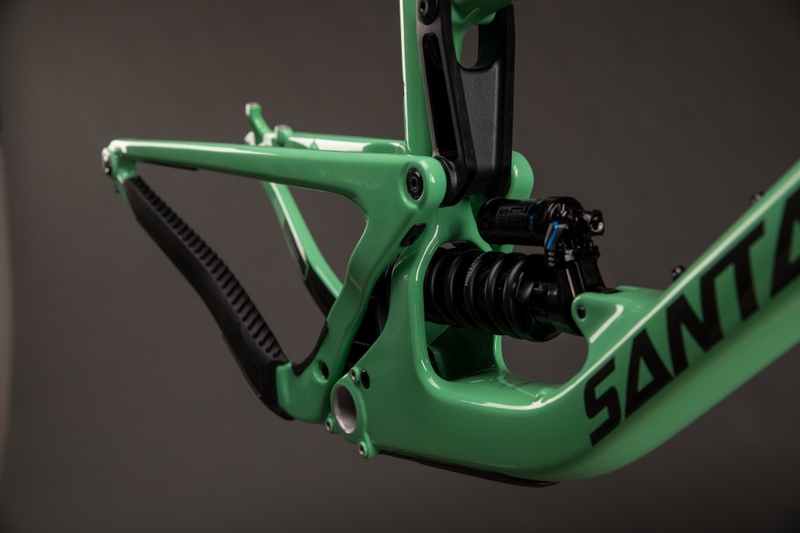 Here’s a breakdown of claimed bike weights, plus more details via a Santa Cruz Megatower FAQ and lots more photos. The geometry chart shows two settings. How do I adjust that? Should I ride in Hi or Lo setting? You should definitely try both, but we typically recommend starting in Hi. 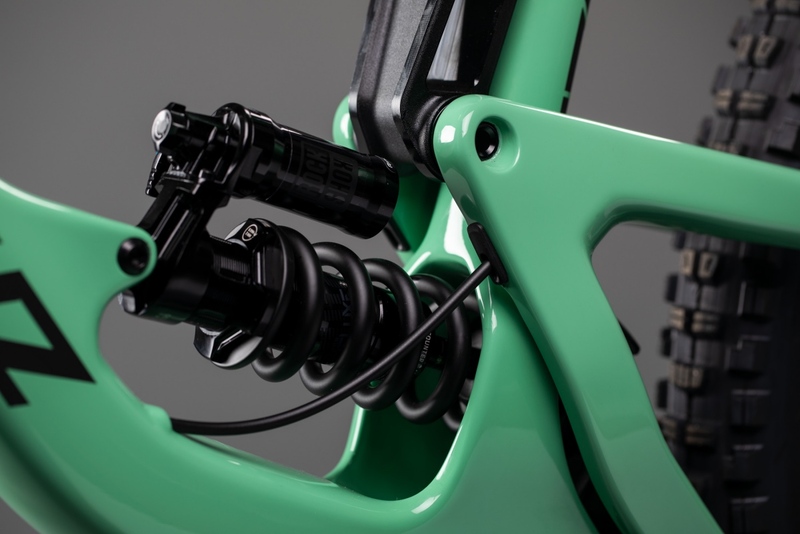 This will make the bike more agile and easy to get used to. 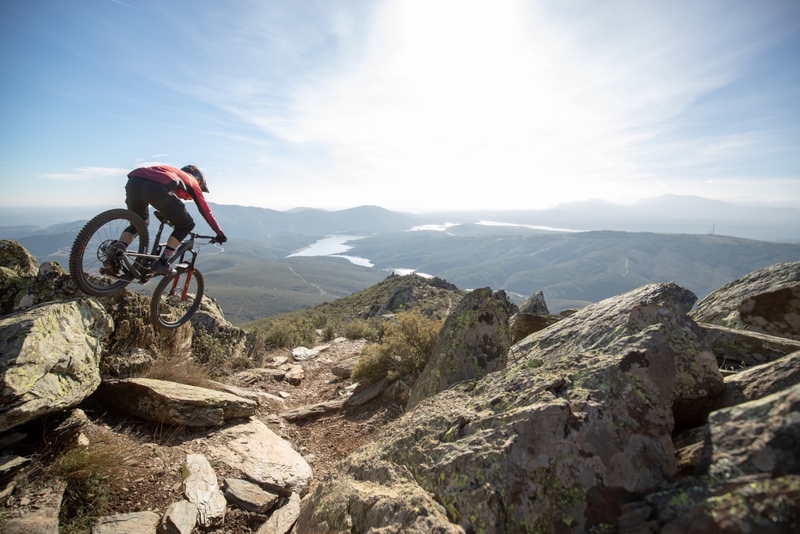 If your terrain is quite steep, give Lo a try. This setting lowers the BB by 3.5mm, slackens the head angle by 0.3 degrees, and generally biases your weight a little further back. 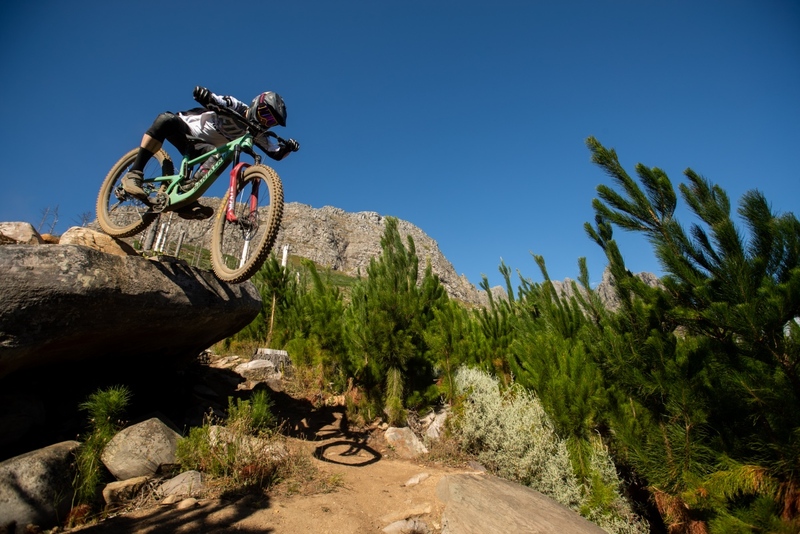 The leverage curve of the suspension changes slightly as well: it’s more progressive. 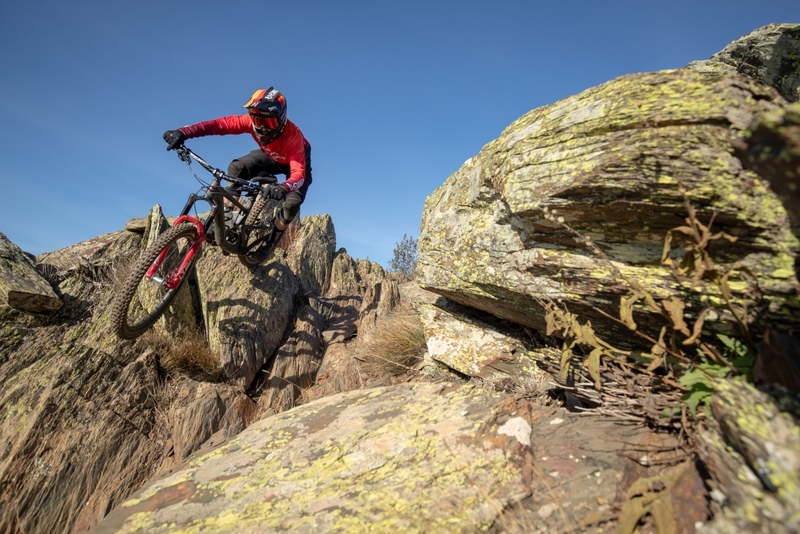 The geometry changes combined with the slight suspension change will make you feel like you’re sat further down in the bike. 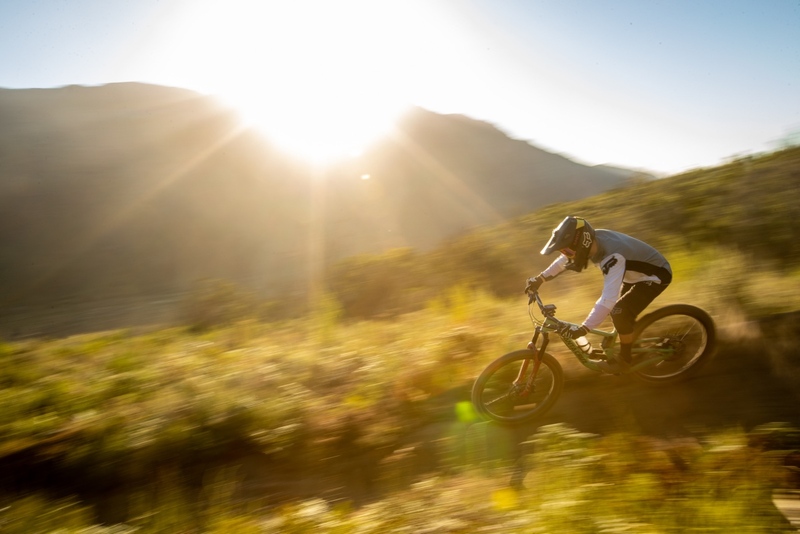 Great for steep gnar, not as good for flatter corners. It’s easy to change, so experiment. 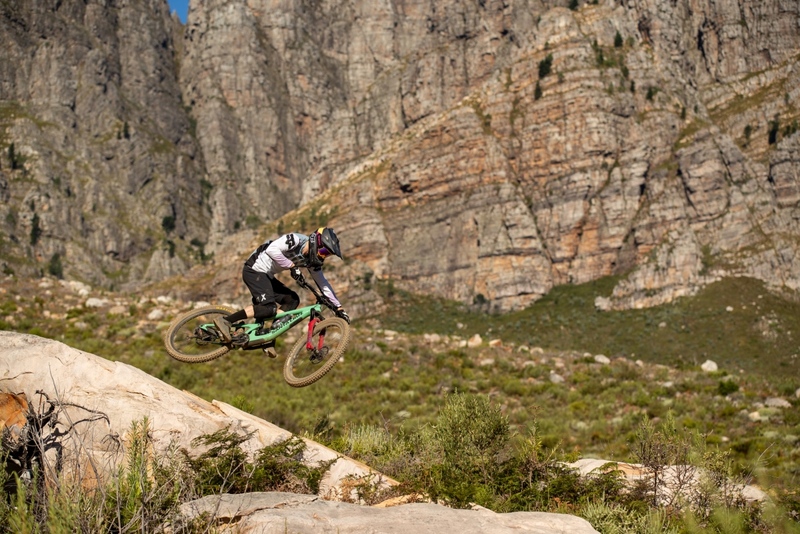 Adjusting chainstay length of the Santa Cruz Megatower changes flickability and tire clearance. The bike ships in the short position, and nothing unusual is required for this setting. The brake mount is Post-Mount 180, so just add whatever adaptor you need to make it work for your chosen rotor size (none if you want 180). 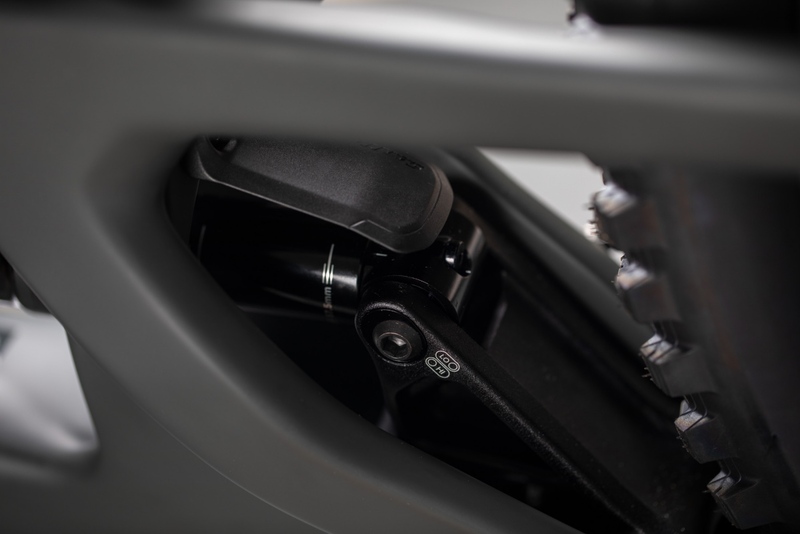 Included with the bike is a special brake adaptor to adjust to the long setting. This setting only works with 200mm or larger rotors. Use the included 1.5mm spacers between your caliper and the bracket if you are using 203. Put the spacers above the caliper if you are using 200mm. Once you’ve changed the adaptor, install the Long derailleur hanger and then flip the chip around in the non-drive dropout. There is a retaining set-screw in the chip. Make sure you loosen this to remove it, then snug it up once you’ve re-installed the chip. In short position, the largest tire we recommend is 29×2.5″. 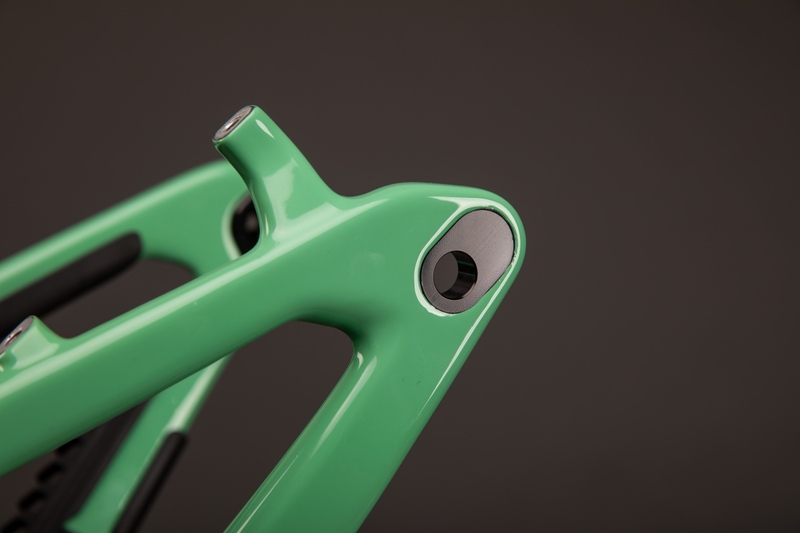 In the long chainstay setting, a 29×2.6″ will fit as well. A water bottle and piggyback shock can be tucked inside the main triangle. 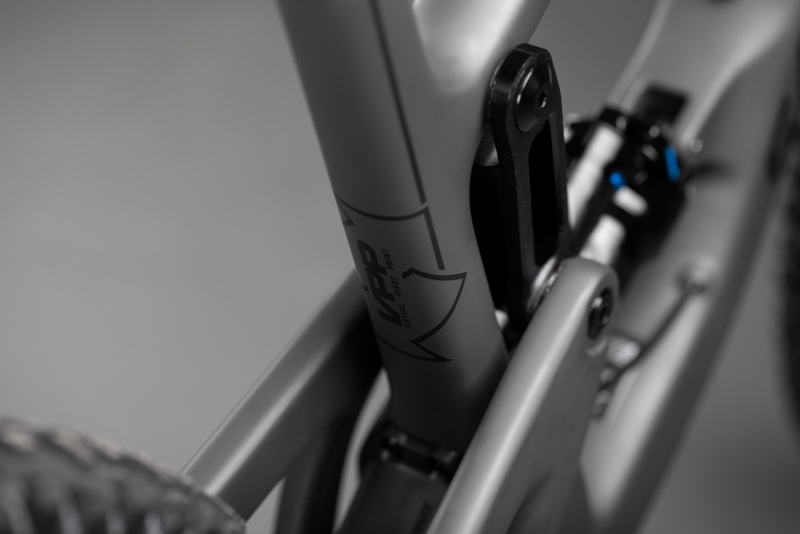 Our geometry is based off of a 160mm fork with a 42 or 44mm offset. We wouldn’t recommend less travel than that, as the BB will get a bit low. 180mm is fine if that’s your preference. Can I put 27.5″ wheels on my Megatower? 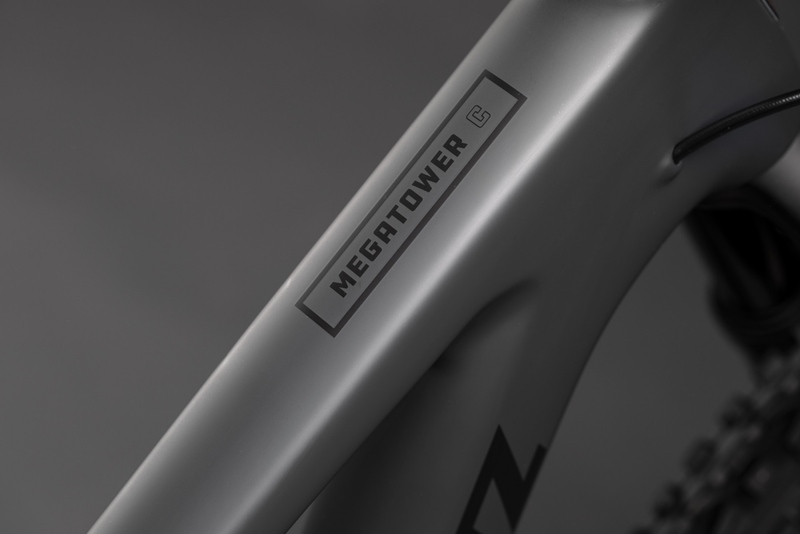 No, the Megatower is built exclusively for 29″ wheels and tires. 27+ tires won’t fit, and the geometry is not setup for a conversion. 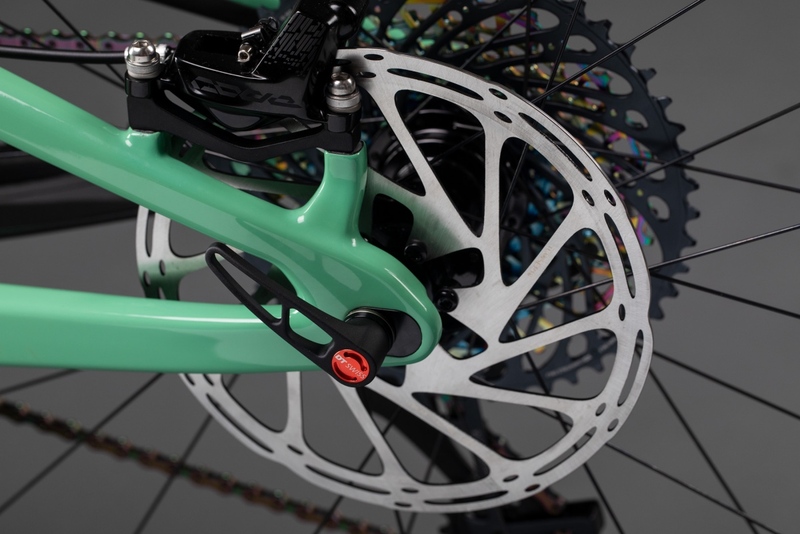 This bike uses integrated headset cups. The upper is 41mm and the lower is 52mm. The SHIS name is IS 41/28.6 IS 52/40. All build options come stock with a chainguide. 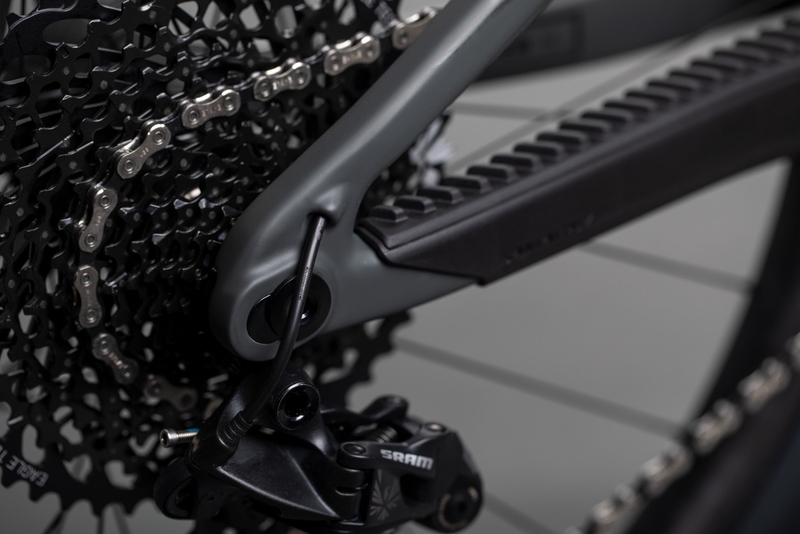 Choose between C and CC carbon frame options. 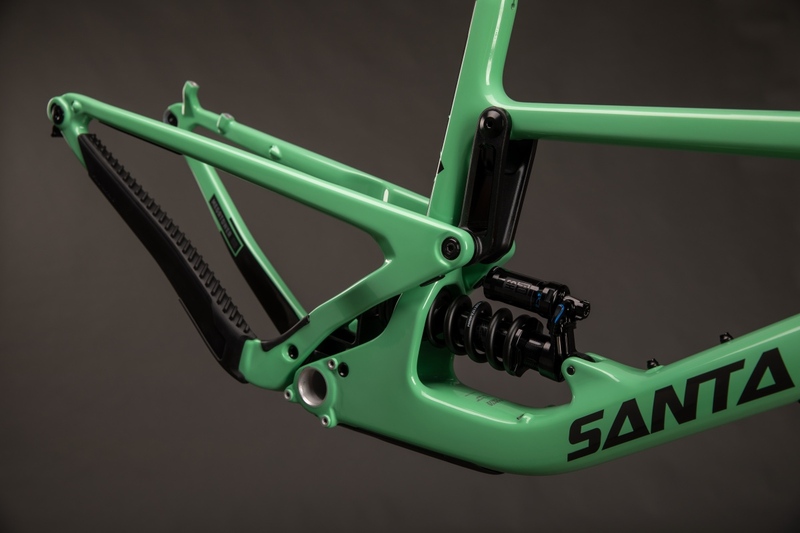 To learn more and see all the complete bike build options head over to www.santacruzbicycles.com. 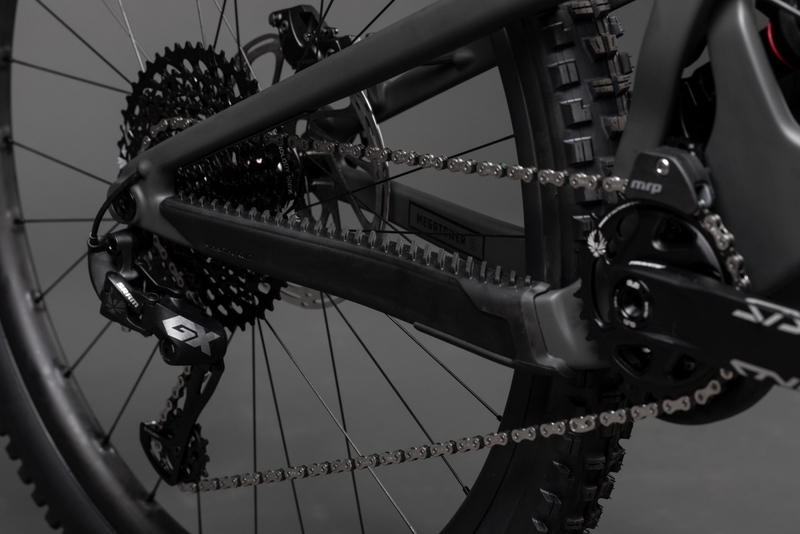 Flip chips on the chainstays and lower link allow for extension performance customization. 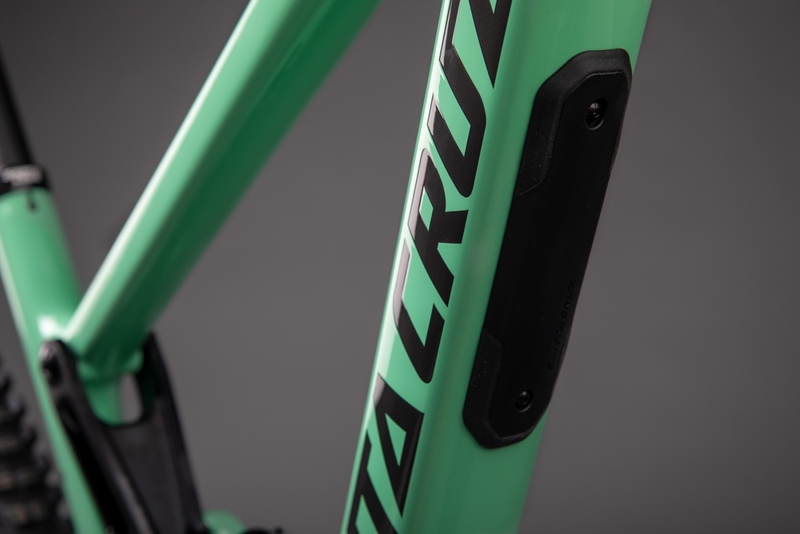 The two frame color options of the new Santa Cruz Megatower. A water bottle and coil shock can be tucked inside the main triangle. 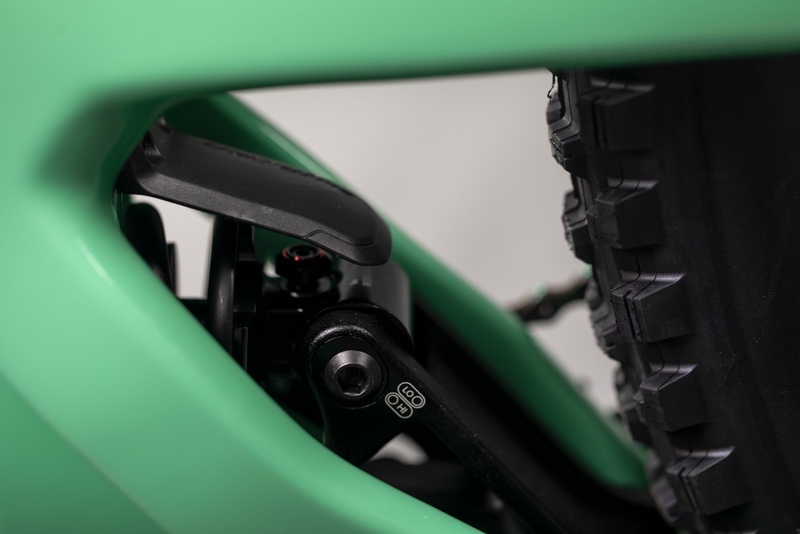 I have compared photos with other steep seat angle and for tall riders I find it very hard to believe this is a 76°, the MBR video review mentioned “69 degree and seating far over the rear wheel for tall riders. 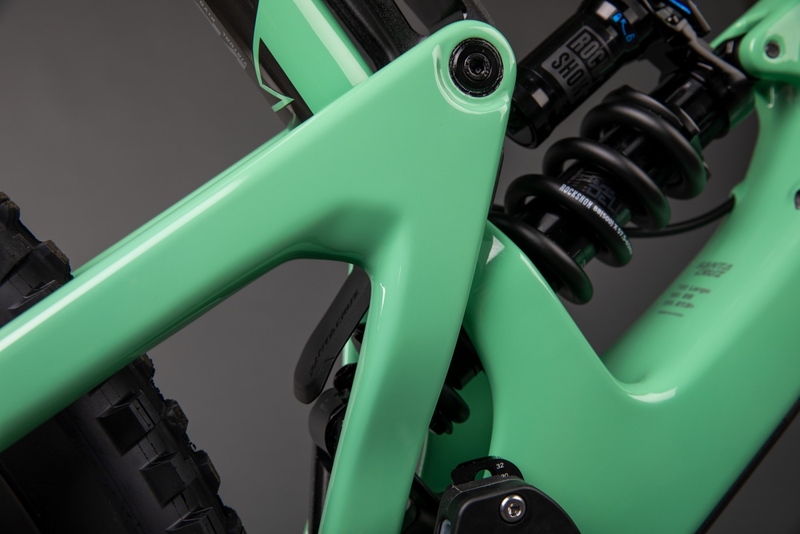 Has anyone real measurement of seat angle on XL and XLL for 6″4 (192 cm) riders ?